Fluffy is a bunny with a big personality. She is a bit feisty and a little territorial but she loves pets on the nose every day. She likes to run and binky but is very hard to catch! Her hair is very soft. Comments for What kind of rabbit is this? 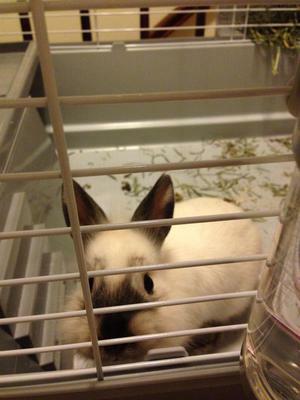 I had a Netherland Dwarf but she wasn’t a mix. They hair around her face looks a bit wild. She looks like a Lionhead mix, not sure of the cross breed but I would not agree with Netherlands Dwarf. Good luck! Your cute bunny looks much like a Nertherland Dwarf!